I'm learning everyday how to be the best version of me. So yeah, I know it’s the 7th and not the 4th but sometimes things are better late than never. Plus I was busy throwing my niece a birthday party. Also, I was really indecisive and couldn’t figure out what I felt like eating. It happens sometimes. I made a lot of poor nutrition choices this past week and need to get back on track because this is week I have a Zumbathon and next week is my first half-marathon. So I have some intense training to fuel up for! My runs continue to be so-so. Some are great and feel effortless and others feel like I’m running with lead shoes and like my bones are made out of jello. I’m pretty sure this means that I’m overdoing it. I’m really looking forward to the race being over and having more balance in terms of exercise. I felt like when I was doing the Body for Life program I was really focused on weight lifting. Then when I did the Whole30 my nutrition was spot on. Now with the training for the half I’m like the cardio queen. Once this is over I need to find how to balance these three areas. 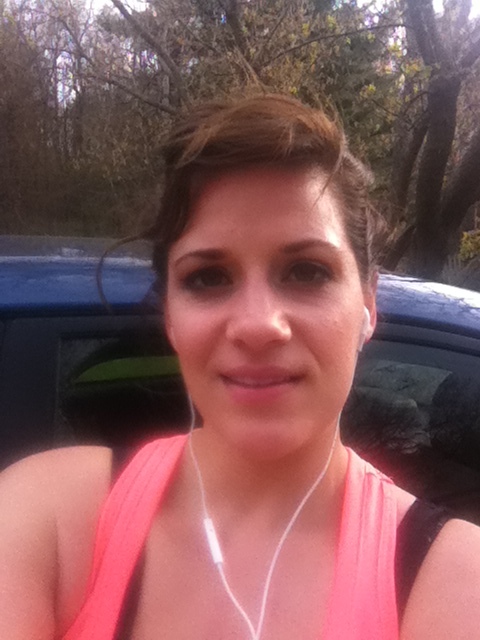 I caught a glimpse of myself in my car windows after a recent run and almost died at how gorgeous my hair looked. I’m pretty sure I used to do this on purpose when Saved by the Bell was on TV. I’m starting to test out non Whole30 foods to see how my body reacts to them. 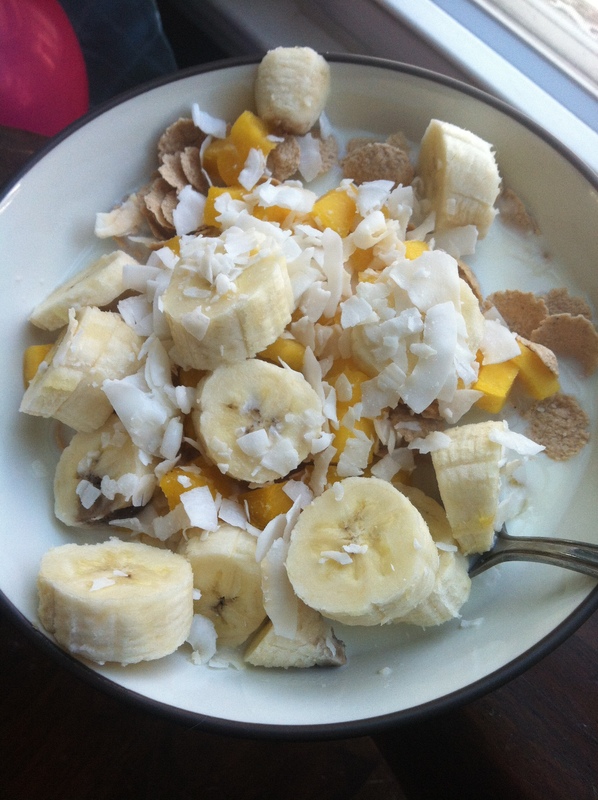 For breakfast this morning I had a bowl of ancient grains sprouted maize flakes with raw milk, fresh mangoes, banana and coconut flakes. It was filling and delicious. 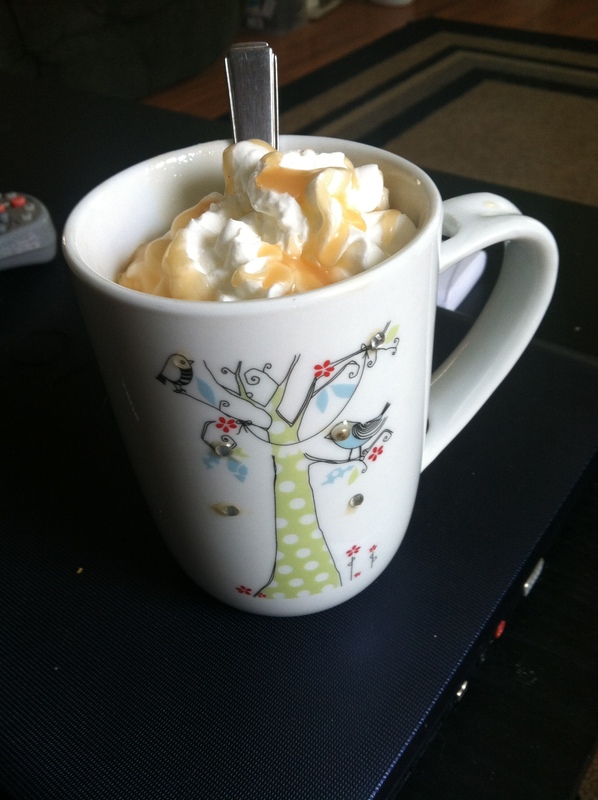 I also indulged in a cup of vanilla coffee with whipped cream and a caramel drizzle. It was fantastic and gave me a raging headache exactly five minutes after my first sip. I’m hoping I’ve learned my lesson and can abstain from sugary coffee beverages. My meals for the rest of the week aren’t sugar shock headache inducing. Tuesday~ 5 mile run/walk (with a super beastly hill in the middle) and Yoga!!! How do you maintain balance with healthy eating, weight training and cardio? I would love to hear any and all suggestions! I'm a continuous work in progress. I'm 31. A professional hairstylist & make-up artist. I love to dance, cook clean food and bake dirty desserts. I really love coffee. I have a monkey dog and a fluffy cat. I love crafts and shopping. I sometimes love working out. I recently married my best friend. Stop by and check on my progress.